Thanks dude I think the Loomis is really helping me. Oil painting might still be a little ways off though but it will happen. The self portrait has some great lighting in it, and well done on capturing your own face! although the neck is a little off, perhaps too wide?..I should know since I'm an expert in other people's neck (it says so on my C.V. too). Chin edge looks a little too sharp? All good stuff sir! How goes the assimilation of Loomis? Really good crits on the s-p, I think I rushed it to the end. I can see some edges are maybe too sharp or too soft, perhaps the fixative blew some of the charcoal off (excuses, excuses!). My main worry is the eyes and glasses feel a tad wonky like the perspective is slightly too exaggerated... My neck is relatively wide if i do say so myself, but perhaps it could've been a little narrower. 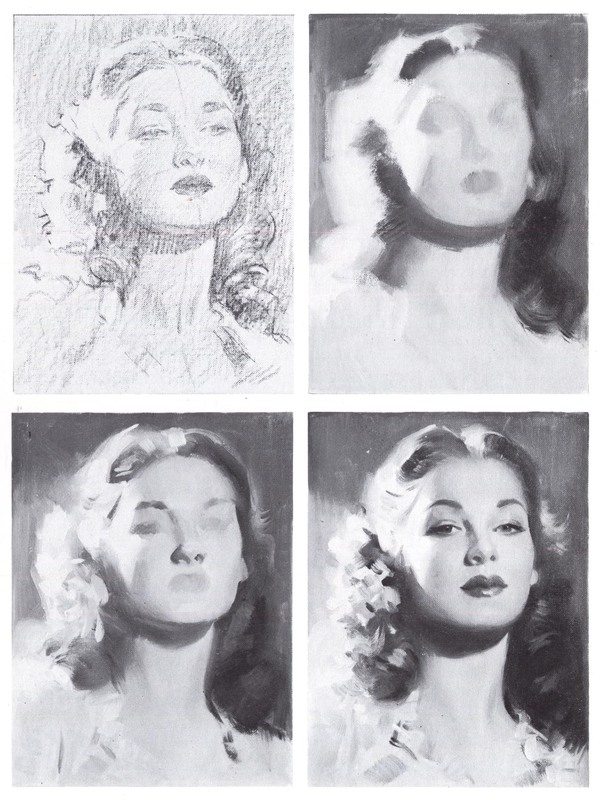 Ahh those delicious Loomis studies, I'm inspired to keep a Loomis sketchbook like you now, try and make them as neat and accurate as yours are! Nope, its my 3rd, not including my crummy avatar. This was meant to be a speed paint. 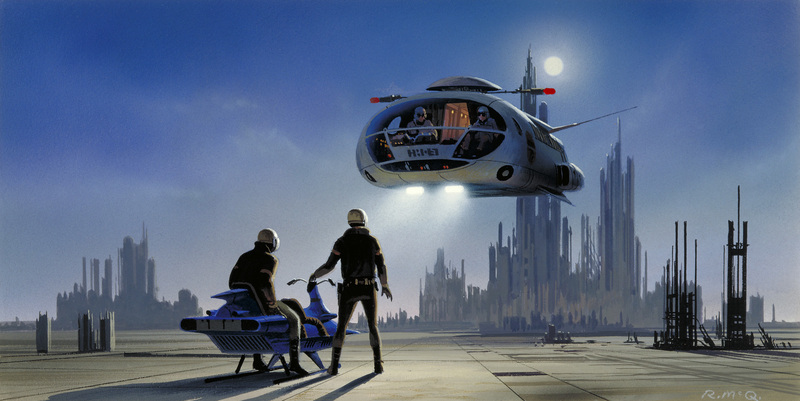 The perspective's off on the flying bus thing, here's the original by Ralph McQuarrie. Concept is look in good, the Loomis studies are paying off! Good fashion study too, nice edges on the creases/folds. Thanks Koto, there's more to come. Starting to oil paint today, kinda unsure what process i'm going to use. Anyway here's some character sketches for the sw comic. This didn't turn out so great, the thin layer of midtone oil underneath (scumble) dried quicker than I expected, so I didn't get to experience the effect of the paints mixing. And a Plein Air, I should have painted a little thicker and covered the canvas more. Your rendering is much more improved, those Loomis studies seem to help also judging from the quality of your block-ins at the life drawing, keep up the daily art routine! that said, I'd still recommend practicing handling, both in how you draw with paint (look at Harold Speed's brush chart to see edge quality) and drawing in general with pencil and charcoal- looking forward to seeing you post the still lifes in progress! I'm not one to comment but that oil still life is looking successful so far to me. nice to see the self portrait too! That last plein air is solid, trees are crazy hard to pain. Your block-ins are looking great, you seem to nail the proportions really well. Cheers I want to get more gesture though, time to read Walt Stanchfield. Wicked update, don't think i saw the final version of that last statue. The 6 hour drawing is tight too! And a plein air... can you spot the water? This is the new house I'll be moving into, drawn from photo ref and then inked. Yep, gotta keep pushin it. Anyway, you need to update your sketchbook/blog. DO EEET. This is my first portrait/bust in oil. Unfortunately the model left half way through so this is 3 hours instead of 6. Painted 5 mins walk from my house. Pure burnt sienna for those plants in the foreground, my folks say they're seeding docks(?). Went to tehmeh's back yard and painted this. Drawn from the actual painting while at the Wallace Collection. You need a better camera or scanner, these look much better in person! Holding back on the updates!! Jesus would not be pleased. i "finished" Figure Drawing For all it's Worth, so I thought why not do some studies of his paintings? Added reversed skin tones from a b&w photo, it's a skin reference for a character. Thank god for blu-ray Star Wars. Wow dude, your digitals have improved a ton, love the Loomis studies. How are you doing these studies, side by side? with a Grid? Thanks mate, I might do some other Loomis studies, his other works I have are more complicated though. I do digital studies side by side at the same resolution. I start off zoomed out and get progressively closer in. So you could call it Photoshop sight size - I sometimes measure down or across with the pen depending how the things laid out. As to using a grid I've never tried it. solid stuff man, I like that bunker but i'm itching to see more original paintings! I've been doing various character portrait requests lately, giving myself an hour on each.